I always try to include my kids when I bake something. Recently, I decided to graduate from making simple brownies and sheet cakes to trying out recipes with yeasted dough. I’ve been drooling over photos of chocolate swirled babka on Pinterest and instagram for the last month or two and I decided to pull the trigger and try out some chocolate babka muffins. And let me tell you, I’m so glad we went for it! 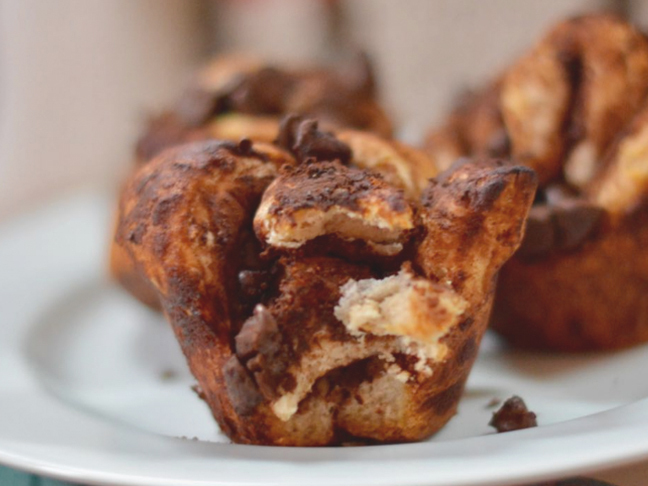 We decided to create the chocolate babka muffins by rolling the dough out out like sweet roll dough. Then we layered in chocolate, cinnamon, and butter to make a paste. 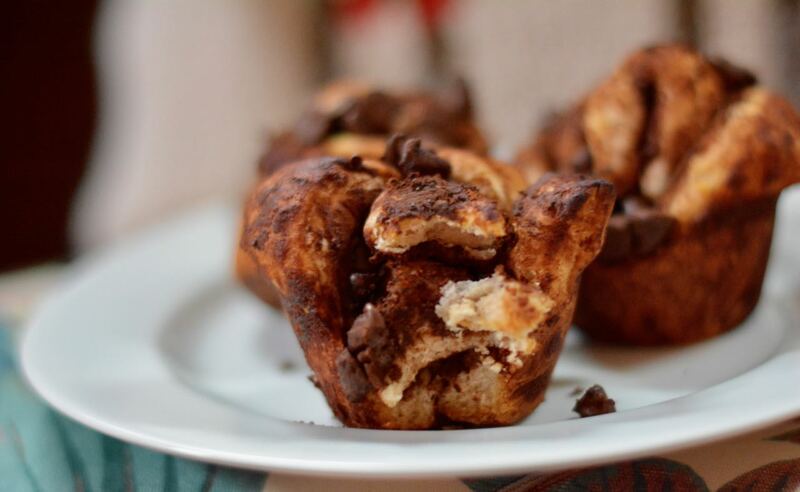 The kids cut the dough into strips and knotted it up before putting it in a muffin tin, adding more cocoa, and a sprinkling of chocolate chips. We let them bake for a little under 20 minutes, standing by the oven as the aroma of sweet cinnamon chocolate filled the air. I barely had time to take a picture before everyone ate them up. They were beyond delicious, such a scrumptious treat for morning! Step 1: Preheat the oven to 375 degrees and grease a 12-inch muffin tin. Step 2: Add the yeast, warm water, and sugar in a small bowl and let it sit for 5 minutes. It should bubble and look foamy. If it doesn’t after 5 minutes, discard the yeast and try with a fresh packet. While this is standing prep the rest of the ingredients. Step 3: Fix the stand mixer with the dough hook. In the bowl of a stand mixer add 2 cups of the flour, sugar, and salt. Set aside. Step 4: Whisk the eggs together in a small bowl. Set aside. Step 5: In a small saucepan over medium-low heat melt the milk and butter, just until the butter has melted. It is stand for about 5 minutes to cool down. Step 6: Add the milk mixture and the yeast mixture to the flour in the bowl and mix it once or twice with a wooden spoon. Then add the eggs and mix with the speed on low. Add another cup of flour while the dough is mixing. Step 7: Once the eggs are incorporated into the batter, add another ½ cup of flour and knead in the mixer for 5 more minutes. Step 8: Lightly grease a large mixing bowl and transfer the dough to it. Cover with plastic wrap and set in a warm dry place, away from direct sunlight. Step 9: To make the chocolate filling melted the chocolate and butter together in a microwave and stir until smooth. Mix in the salt and cinnamon. Allow it to cool slightly. Step 10: Once the dough has doubled in size transfer it to a floured work surface. Use a rolling pin, patted with flour, the roll the dough to a 18x12-inch rectangle. Step 11: Swipe the chocolate spread all over the dough, leaving about ½-inch border around the dough. Roll the dough lengthwise (from the 18-inch side) up like a log. Then, use a knife to cut the log into 12 even pieces, they’ll look like pinwheels with the chocolate swirl in the middle. Step 12: Squish the rounds into the muffin tin (this is where my kids like to make them into knots) and top with a sprinkle of cocoa powder and a sprinkle of chocolate chips. Step 13: Bake for 15 to 18 minutes, or until the tops of golden and the chocolate babka muffins are firm. Allow to cool and enjoy!